I reviewed it with other company's products, but I made it to price here. Although I have used it only several times, it is very easy to use, Because Koshi is quite strong, it was easy to measure even when it was one person. This review is about item#37683572. This review is about item#37683581. I am thankful that there were only cheap on scale with scale calibrating magnets, but it is appreciated, but when pulling the scale out, it gets caught in the inside guide and it catches occasionally. It is troublesome to fix each time because it will not return if caught. Easy to lock (lock), very easy to use. It is convenient because you can just look at the conversion between 尺 and m (cm). It is easy to use with a magnet at the tip. Cospa is also good. This review is about item#37683563. 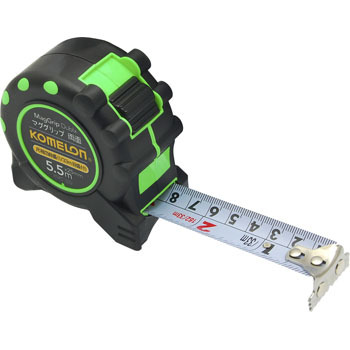 When the width of the tape is large, it is handy and convenient without grabbing at the time of measurement. I can use it firmly for the price. It is surprisingly convenient to have a magnet. I feel that it is somewhat heavy, but I like it because it is solid in material terms. The price is also generally satisfied. Purchase self-lock type of Comeron before, buy one rivet at the tip hooked part and repurchase. Self-rock is getting weaker. So I chose who is not selfish. I bought it at the home center instead of purchasing here, but it ceased to get involved in just three days after purchase. Because I will not get rid of the inside garbage, I have disposed of it and purchased a new one. I will not purchase this product again. Measure Tape, "Self Lock Crome"
Measuring Tape, "Double Lock Convex"
Measuring Tapev, Self Stop, "Toughr Gear HG"